In this article, we'll share the criteria for assessing hosting services, present the rating of the most popular hosting companies and give recommendations on choosing the best one depending on your individual needs. A web hosting is the foundation of a website. If your hosting is ineffective, you can forget about the successful and productive performance of your WordPress site. A proper hosting can help you improve the SEO performance of your web resources, attract additional traffic, load web pages faster, provide an adequate site security and even increase sales. Choosing a hosting service provider is a complicated process. As a rule, a customer has high demands and, at the same time, wants lower prices. The search for a decent hosting service can take days of research, make your eyes red and your head crack with tons of information. There are various options available for hosting a WordPress website: it can be virtual shared, private, dedicated or managed hosting. In this article, we will review the criteria for assessing hosting services, present the rating of the most popular hosting companies and give recommendations on choosing the best one depending on your individual needs. After reading this article, you should already be able to select the best placement option for your website, even if the word “web hosting” is a new word in your vocabulary. Hosting companies provide space on their server for rent to anyone who wants to launch a website. Imagine that a hosting company is a landlord and each apartment represents a leased space on servers. Just like you need a place of residence, a website requires a server and a hosting provider. If your website is powered by WordPress, it will require additional resources for uninterrupted performance and scaling in case of a plan for a further increase of audience. So, you need a web hosting provider that specializes in hosting WordPress sites. How to Choose WordPress Hosting? Various parameters play a significant role in the choice of web hosting. There is no universal recipe as each case is unique. WordPress is a fairly democratic platform and is compatible with many web hosting companies. As WordPress is a highly popular content management system, almost all of the leading hosting companies provide an option to install it with one click. Therefore, we have prepared an overview of the top hosting services that provide professional support for those who want to launch their website with WordPress. What Should You Consider While Choosing WordPress Hosting? Speed, security, and reliability are the three most significant factors for maintaining your website. Hence, these requirements are a necessary minimum when choosing a web hosting. Of course, it makes sense to make careful research of available options because it may save your time and money later. So, What Should You Take into Account When Choosing a Hosting Company? Obviously, it’s an important factor when choosing any product or service. However, it should not be a decisive factor. Therefore, before you buy the cheapest option, do not forget to read all the features that the hosting provides carefully. Keep in mind that you get what you pay for because web hosting companies, like any other businesses, are focused on profit. The price of web hosting depends on various factors, such as the quality of support and the load speed of pages. In the beginning, when you’re just launching your website, shared hosting plans should suffice for you. Once your website’s audience starts expanding, you can upgrade to a better service that costs higher. So keep in mind the scaling from the beginning. Decent hardware is essential for ensuring a high-quality hosting service. The memory (RAM), processing power and disk space (HDD and SSD) are necessary for determining the overall efficiency of your website. The criteria for choosing your RAM and processor depend on the type of content of the website and the number of visitors. For example, if you create viral content, the minimum features will not be enough to handle traffic. If you use the most basic hardware options, your site will slow down and may even shut down. Usually, you can check these metrics on the control panel of your hosting. If you’re close to the limits, then it’s time to update your hosting plan. It is important. If the hosting company does not have technical support, it’s not worth the risk. If the technical support is available, then see how you can contact them. Only e-mail? Not the best option. Chat + Email? Not bad. Phone + chat + email? Great! However, dig deeper, make a test call. You are likely to be connected to the sales department, but you will certainly understand what level of support you receive. Long response time and many redirects are not a good sign. Tech support is similar to a football defender who must enter the game if something goes wrong. Do you need a weak player? Why? Go for the best ones! Do not forget the instructions. Proper manual guidance can save you hours of time and nerves. Each hosting company provides various hosting plans with different settings. The amount of disk space, e-mail accounts, disk space allocated to each email account, bandwidth, RAM and other features vary depending on a specific plan. Usually, each hosting provider offers several types of hosting plans, each of which has particular functions with a certain amount of RAM, disk space, and so on. For example, one of the key differences of a given hosting plan is the operating system installed on hosting servers. Most companies offer Linux-based solutions by default because they are cheaper (no need to pay Microsoft for a license) and are better compatible with popular content management platforms. Windows hosting is necessary if you have a custom website based on a programming language developed by Microsoft, for example, ASP.net or C#. If you do not have a site configured for ASP.net, choose a standard Linux hosting. Where is your company located? Which countries are your target audience? Let’s say you’re located in Germany and run a website for the USA. Guess where do you need your servers to be? Bingo, that’s the USA! Remember, the further your hosting from visitors, the longer your site will be loaded in the end. Always check where the hosting servers are located and keep in mind that you need to keep them close to your visitors. Shared hosting is one of the most popular options at the most affordable price. An excellent solution for starters! While using a shared web hosting, you will share server resources such as memory, processing power, etc. with other clients utilizing the same server. The advantage of shared hosting is that it reduces costs for both you and the hosting service provider. The downside is that you get limited resources for use. With the growth of the popularity, your website will require more resources than is available in the capacity of a shared web hosting. Shared hosting is used by novice bloggers, design agencies, small e-commerce sites, freelancers and small businesses. Managed WordPress hosting is designed to help you get rid of the tedious technical tasks of your WordPress maintenance. 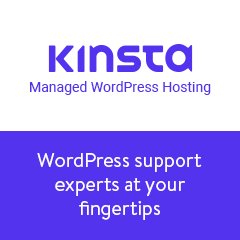 Kinsta is a good example of managed WordPress hosting provider that care of all technical needs regarding your website. We have conducted a stress test on the most resource-intensive theme in our portfolio – Motors, see the results here. Today managed hosting is used by many companies – from small blogs to large online shops with hundreds of thousands of visitors a month. With VPS (Virtual Private Server) hosting you will have your own partition on the server with protected and reserved memory and processing power. Unlike in shared hosting, no one can affect the performance of your website. You have full root access to the server, and you get much more freedom to make changes to aspects related to performance. For example, you can increase memory and power (at an additional cost) as your business grows. It’s perfect for fast-growing websites, medium-sized businesses. If you buy a dedicated server for hosting, you will be assigned a separate physical server that is intended to be employed solely by your website. As a result, all the memory and processing power of the server will be at your disposal. However, depending on the features, dedicated servers can cost hundreds, and sometimes thousands of dollars a month. In addition, extensive knowledge will be required for setting them up. It’s a good option for enterprises and advanced users who run sites with high traffic and web applications with intensive use of resources or complex databases. Do not neglect the reviews from other customers who have experience with the hosting services that you are about to get. You can find many websites with reviews and ratings from actual users. However, even if the service has bad reviews (and you are sure to find them), check that the company representatives respond to them. Reliable hosting companies surf the reviews on authoritative sites and respond to negative feedback, advise clients and try to solve their problems. Published reviews (and still accepting user reviews). 1. Understand what kind of website you are going to create. Is it a small, medium or large project? Once you figure it out, you’re halfway there. 2. 24-hour technical support available through various communication channels, and satisfactory guiding materials. 3. Check the technical features you get with the web hosting. 4. Check the price. Does your budget match? We hope that our independent analysis has helped you choose the best hosting for your WordPress site. If you have any questions, please leave us a comment below – our support team will give you a detailed answer as quickly as possible. Do not hesitate to share your stories about working with hosting providers. And do not forget to subscribe to our updates to learn more about how to create a website and put it on the rails. Managed WordPress Hosting by Kinsta: Does it Worth the Money? You’ve included some great tips in this post. I would only add that choosing a web hosting plan with SSD storage will ensure a faster website’s loading speed. Compared to plans, which include traditional HDD, I think SSD hosting plans are not a lot more expensive, but they definitely have more advantages. One can find a very reliable hosting plans for about $10-15 per month. And, speaking of affordable hosting, from my personal experience, I can say that the web hosting plans, offered by BGOcloud, are quite reliable as well. I have had almost no downtime for the past 5 months.